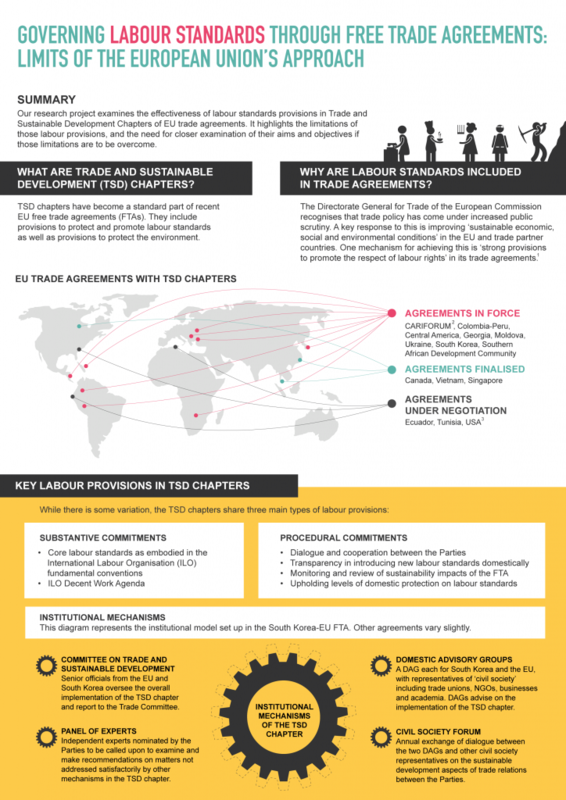 This research project examines the effectiveness of labour standards provisions in Trade and Sustainable Development Chapters of EU free trade agreements. It highlights the limitations of those labour provisions, and the need for closer examination of their aims and objectives if those limitations are to be overcome. This summary is based on various research papers which are available on request from the authors. 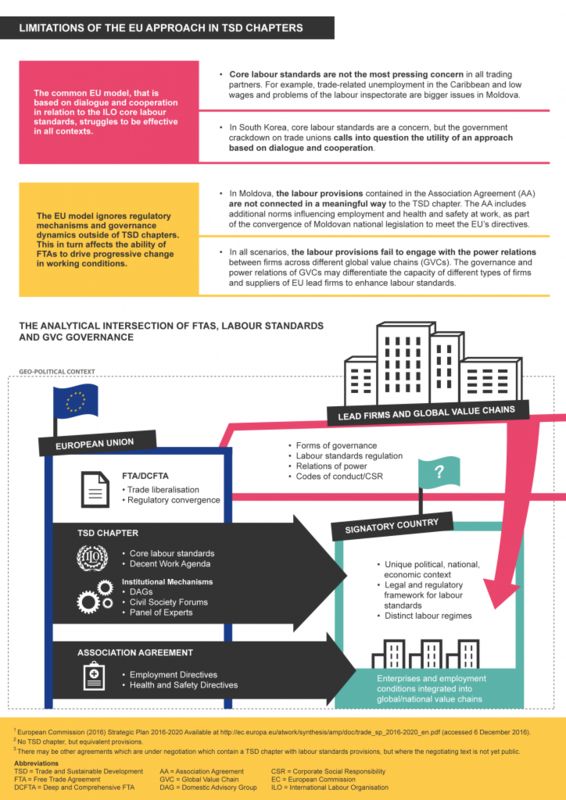 The research was conducted as part of an ESRC-funded project entitled “Working Beyond the Border: European Union Trade Agreements and International Labour Standards” (2015-17) (award number: ES/M009343/1). The project team are Adrian Smith a.m.smith@qmul.ac.uk, Liam Campling l.campling@qmul.ac.uk, Mirela Barbu m.barbu@qmul.ac.uk, Ben Richardson B.J.Richardson@warwick.ac.uk, James Harrison J.Harrison.3@warwick.ac.uk. 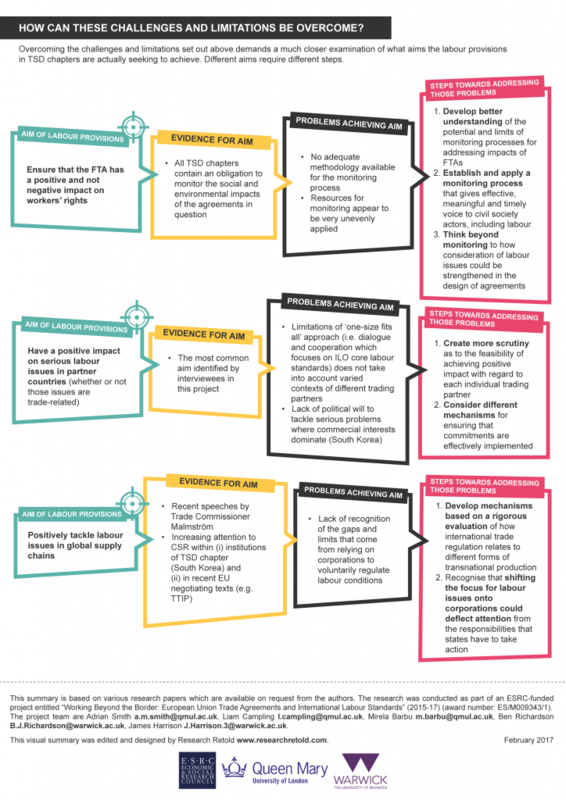 This visual summary was presented at this policy seminar in Brussels. The research was edited by Mihaela Gruia (@mihagruia) and graphic designed by Radina Metodieva.